Have a Backyard Picnic/BBQ: What better way is there to celebrate America’s birthday than having a feast? Pinterest can provide you with tons of fun and celebratory food items such as firecracker dogs, fully loaded baked potato salad, and an M&M flag cake for dessert. Dress Up & Decorate: Independence Day means it’s time to dawn your best red, white, and blue gear. So pull out the American flag clothing or make your own shirts and bandana skirts this year! Once dressed, it’s time to decorate. Spruce up your lawn and show the neighbors how patriotic you are by painting lawn stars, or make your own red, white, and blue, mason jar candles! 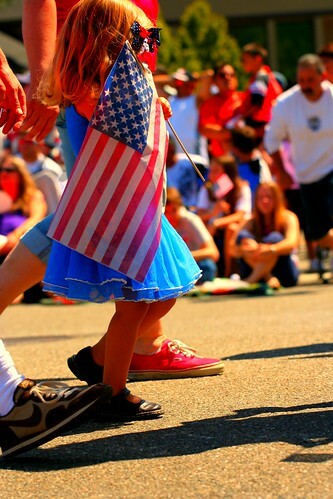 Go To Parade/Fireworks: Two of America’s favorite 4th of July traditions include parades and fireworks. Cheer on America by going to your local parade in the morning and attending a firework’s show at night. Don’t forget the cozy red, white, and blue tie blanket and be sure to show up early to both events to get ahead of the crowds. Watch a Movie: After all that 4th of July fun, you and the family may be feeling a little pooped out. However, you can still keep the celebrations going in a low key way by watching a patriotic movie! National Treasure, The Patriot, Lincoln, or everyone’ s favorite classic, The Sandlot, are all great picks to end the holiday in a fun and relaxing way.